Dr. Karl Burgher, P.E., holds a Ph.D. and an M.S. in mining engineering, specializing in pricing and markets, costing, and resource economics, as well as B.S. degrees in both engineering and economics. He has worked almost 30 years in higher education institutions, including Indiana State University, Missouri S&T, the University of Maine-Presque Isle, Fairmont State University, and Montana Tech. He has carried out administrative duties as chief strategy officer, vice president for research, center director, director of institutional research, and president. He spent a decade of this time managing contracts with federal and state governments and with the private sector. Much of his work has involved university start-ups and change management. He has also has held the rank of Professor and has received tenure in mining engineering, civil engineering technology, business, and built environment departments. He has taught courses in management, construction management, engineering management, business and economics, explosives engineering, operations research, simulation and project management. Karl recently stepped down as chief strategy officer at Indiana State University and is currently a professor of the built environment. Dr. Burgher’s extensive experience in volunteering and in managing volunteers spans over three decades. His initial experience was in the management of a small food buying co-op while an undergraduate engineering student. He has provided educational outreach, strategic planning, and technical assistance to numerous organizations and communities, including work paid for by the US-EPA in economically disadvantaged urban Hispanic communities in Denver and Pueblo, Colorado; and for Native American tribes across the western United States. The objective was to build capacity in volunteer and non-profit groups in communities facing environmental remediation and reclamation challenges. As a teacher / professor at heart, Dr. Burgher has spent innumerable hours mentoring undergraduate and graduate students and the individuals in volunteer groups in many venues. His primary objective has always been to build capacity in people and groups so that they can help themselves, thereby eliminating dependencies. During his three years in the engineering management department at Missouri S&T, he passed on to students his enthusiasm for volunteering, working with them to complete 150 engineering work plans in nine rural Ozark communities. His and his students’ efforts have led to numerous community-wide infrastructure improvements. For his commitment and dedication to these projects, Dr. Burgher won the campus’s first service learning award in 2009. The stories and examples found in this text all come from on-the-ground experiences working with volunteers and knowledge workers, in addition to the day to day idiosyncrasies of life in higher ed and on construction projects—in truth—not as different as one might think. Karl resides in the Missouri Ozarks with his wife, Lynn. Mike Snyder’s primary expertise lies in project management. 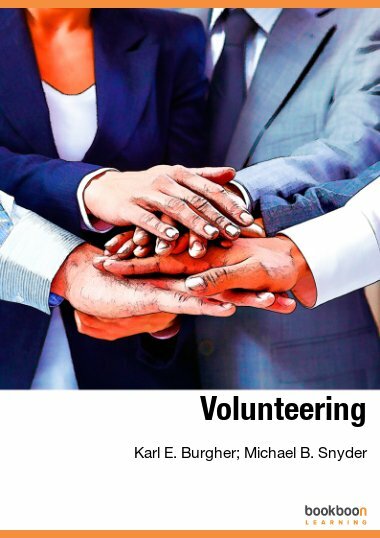 Volunteer organizations as much as any other, perhaps more, survive day in and day out through project completion. Mike has learned his skills on the ground every day working with mostly knowledge workers and in the classroom. He has both formal training and on-the-ground project management experience, an excellent and balanced combination. For more than a decade, he has led teams and projects through to successful completion. After working in the private sector for nine years, for a Fortune 500 company, Mike joined Indiana State University’s administrative staff in 2008 as project manager in the Office of Information Technology. There, he has taken on numerous technology-based responsibilities, most recently as director of enterprise services, a title he still holds. His skills include program analysis, program and project management, software development, resource management, cost benefit analysis, user and functional requirements gathering, architectural design, and documentation. He also has extensive experience in communications and leadership. In his current role as executive director of strategic initiatives at Indiana State University, Mike works in concert with the president, the president’s cabinet, and all members of the university community to successfully implement and maintain the university’s strategic plan and other strategic priorities. He also manages the institutional research and business intelligence units on campus. Mike is a highly skilled and multi-faceted project and program manager working in numerous areas across campus. Mike earned a B.S. in computer science from Pacific Lutheran University in Washington State and his M.B.A. from Indiana State University in May of 2014. He is also a certified project management professional. Mike and his wife, Annie, reside in Terre Haute with their daughter, Allison. Karl and Mike have worked together on many projects over the last four years together, working through the challenges of change management in a volunteer-like knowledge worker environment. They worked so closely that when Karl moved to the faculty in January of 2014 Mike seamlessly stepped right in, taking over the responsibilities associated with managing Indiana State’s strategic plan. This book is a culmination of their experiences, numerous articles they have written together for publication in professional journals, and their professional presentations and short courses.